With the school year getting back into full swing, I’m scheduling all of my work for Nurture (which tends to be most active during the school season). Nurture’s mission is to empower children and families to eat healthy on a budget, with limited time, and without complex recipes. We use slow cookers and rice cookers (which we often gift to participants in our programs for resource-limited families) to make healthy cooking doable despite all the obstacles of limited time, budget, and know-how. Right now I’m scheduling some work with the local hospital for their program called YEAH (which I love), and I’m sorting through some recipes I think we could prepare for the families. 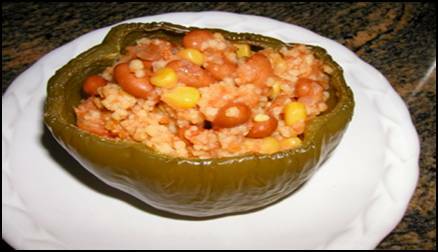 Comfort food is a great option, so I’ll suggest Stuffed Bell Peppers with Cous Cous and Pinto Beans. Doesn’t that sound yummy? It’s slow cooker friendly and easy to customize to whatever you’re craving. Don’t have whole wheat cous cous on hand? Try cooked brown rice or quinoa or bulgur or millet. Change out the pinto beans for black or white or kidney. Use marinara sauce instead of salsa. And the cheese? Look through your stash and see what you want to use up. Beyond the comfort factor, stuffed peppers can be a great vehicle for just about any leftover that needs to make it to another meal. See the full recipe (as a PDF) at our Nurture site in both English or Spanish. I’m also scheduling all my visits to schools to do “Rainbow Days” (eating colorful fruits and veggies) as well as my nutrition lessons on MyPlate, Portion Distortion, Better Beverages, and much, much more! how and in which way your meal can reach me? your meal is very nice and i need it now.